This product is manufactured by acetylene catalytic decomposition over Ni-Cu/A2O3 catalyst. The content of helical structure CNTs is about 90wt%. The rest is ordinary CNTs. 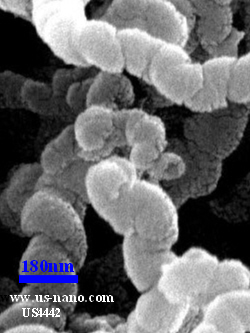 Potential applications of carbon nanotubes are: (1) additives in polymers; (2) catalysts; (3) electron field emitters for cathode ray lighting elements; (4) flat panel display; (5) gas-discharge tubes in telecom networks; (6) electromagnetic-wave absorption and shielding; (7) energy conversion; (8) lithium-battery anodes; (9) hydrogen storage; (10) nanotube composites (by filling or coating); (11) nanoprobes for STM, AFM, and EFM tips; (12) nanolithography; (13) nanoelectrodes; (14) drug delivery; (15) sensors; (16) reinforcements in composites; (17) supercapacitor.